On August 20th 2012 Nevada-Cure sent this message out via email about retaliation against a prisoner held in NNCC (Carson City, NV). It appears Prisoner TRAGALE is being retaliated against for trying to help another prisoner, who is blind, mentally ill and unable to care for himself, have a guardian appointed to the prisoner to help him with his needs. 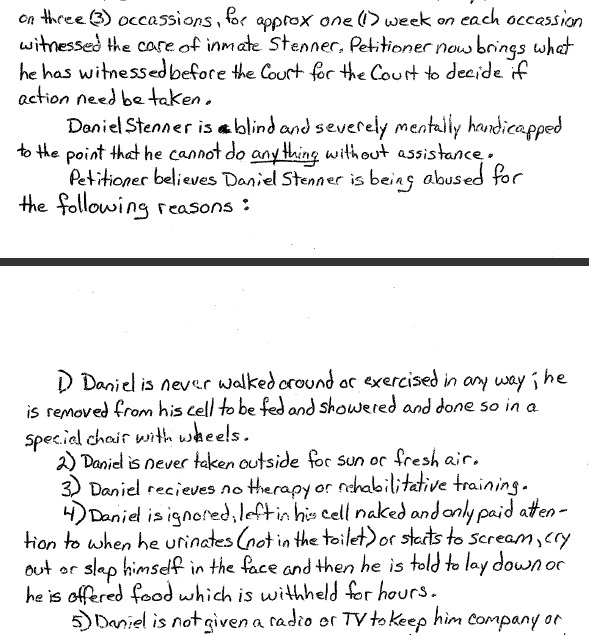 Philip Tragale has asked the Courts for a Guardian and/or Lawyer to protect prisoner Daniel Stenner who is blind and mentally handicapped. Mr Tragale filed the text here underneath to the District Court in Nevada on June 6th 2012. We have another case Mr Tragale filed which contains complaints about a few employees of NDOC who are alleged to be abusive towards prisoners. We will soon post that case here too. Please write to your Legislator and Director Cox of NDOC to ask them to have an independent commission look into these alleged abuses, and have them stopped. NV-CURE has not conducted an independent evaluation of Mr. Tragale’s claims. However, such an investigation must be conducted by a person that is fair and impartial. The truth and actual events must be made public and scrutinized by the Legislature. Please e-mail / write NDOC Director COX and members of the NV Legislature with your views and opinions on this matter. Comes now, Petitioner, Philip Tragale, and requests this Court to appoint a guardian for inmate Daniel Stenner, outside the NV Dept. of Corrections to protect inmate Stenner from the immoral, neglectful and abusive actions and practices of NDOC staff as will more fully appeare herein. 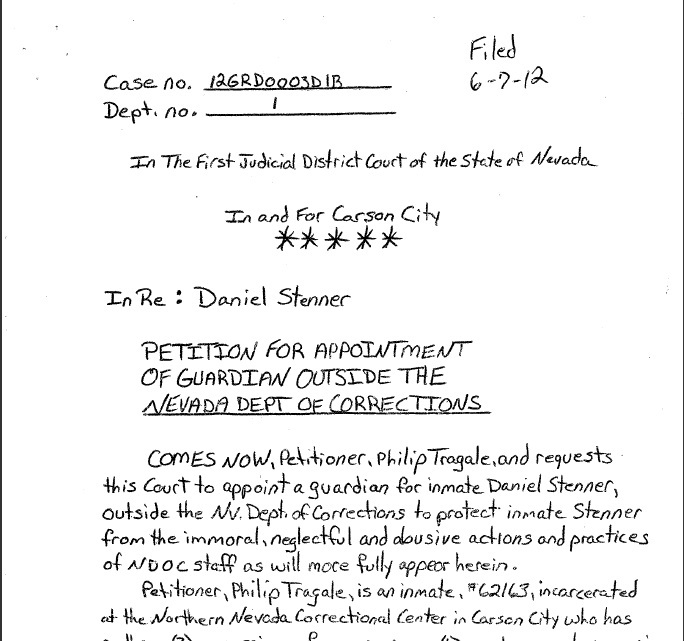 Petitioner, Philip Tragale, is an inmate, #62163, incarcerated at the Northern Nevada Correctional Center in Carson City who has on three (3) occasions, for approx. one (1) week on each occasion witnessed the care of inmate Stenner. Petitioner now brings what he has witnessed before the Court for the Court to decide if action need be taken. Daniel Stenner is blind and severely mentally handicapped to the point that he cannot do anything without assistance. 1) Daniel is never walked around or exercised in any way; he is removed from his cell to be fed and showered and done so in a special chair with wheels. 2) Daniel is never taken outside for sun or fresh air. 3) Daniel receives no therapy or rehabilitative training. 4) Daniel is ignored, left in his cell naked and only paid attention to when he urinates (not in the toilet) or starts to scream, cry out or slap himself in the face and then he is told to lay down or he is offered food which is withheld for hours. 5) Daniel is not given a radio or tv to keep him company or for mental stimulation nor does anyone spend time with Daniel just to try to engage him in conversation. 6) Daniel’s meals are left to sit on the counter, in the open air, uncovered, for hours before it is fed to him cold, congealed, and dried out and only after hours of Daniel crying out and being told he’ll be fed soon over and over again. 7) On one occasion Petitioner heard and saw Correctional Officer Cardella approach Daniel’s cell and in a low voice so no one could hear tell Daniel “You’re a F…ing B..ch.” Cardella then went to the doorjam and repeated his comment. Petitioner was in the next cell and when he witnessed this he began to scream at c/o Cardella to leave Daniel alone. Petitioner reported this to all present staff. 9) Petitioner has heard c/o Cardella talk about “pile driving” inmates and fears that if c/o Cardella ever gets a chance he will severely injure Daniel. 10) It appears to Petitioner that Daniel no longer even understands that he is in prison. Petitioner submits this petition in good faith and swears to its contents under penalty of perjury. Further, Petitioner would polygraph and/or testify to these matters in any investigation or Court proceeding. 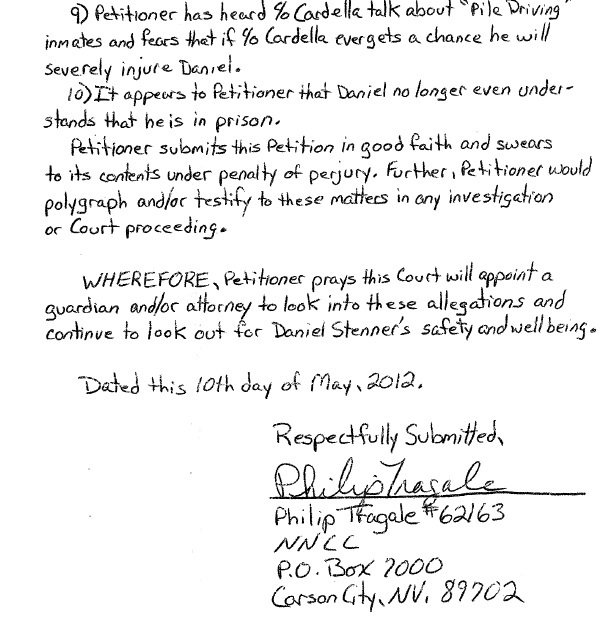 WHEREFORE, petitioner prays this Court will appoint a guardian and/or attorney to look into these allegations and continue to look out for Daniel Stenner’s safety and wellbeing. Dated this 10th Day of May, 2012. Please call today to have these important Bills heard!